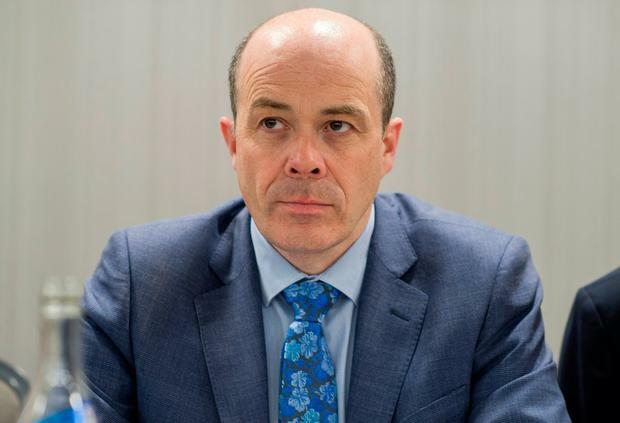 Denis Naughten warned the bidder for the National Broadband Plan (NBP) that its estimates for costs and revenue were too conservative - and the Government subsidy it would require wouldn't represent value for money. Mr Naughten stepped down as communications minister last week, amid accusations the process for the plan had been contaminated by his allegedly inappropriate contacts with David McCourt, of Granahan McCourt, owner of Enet, the only remaining bidder for the NBP. Minutes of a meeting held on June 26, attended by Mr Naughten, Mr McCourt, the secretary general of the Department of Communications and other representatives of the consortium, highlight the then-minister's concerns at that time. "The bidder was adopting a conservative position in respect of both potential costs and potential revenues," the minister's recorded comments said. "With this likely to result in the bidder seeking a level of subsidy that he, as minister, could not recommend to Government and which the secretary general as accounting officer could not recommend as representing value for money." At the time of the meeting Enet, a consortium led by Granahan McCourt and including SSE, was the only bidder left in the race. The following month, SSE dropped out of the Enet consortium. The minutes showed the secretary general "commented strongly" on his understanding from the NBP team "as to the level of conservatism" being adopted by the bidder in developing its model. In response to questions about the minister's comments, a statement from the department last night said the Government's priority was to bring the procurement process for the NBP to a conclusion in a fair and impartial manner, as quickly as possible. "In parallel to the evaluation being carried out by the department, the Taoiseach has sought a report from the independent process auditor to the NBP procurement," it said. Mr Naughten did not respond to a request for comment. A spokesman for Granahan McCourt said: "I'm afraid we're not in a position to comment at this stage in the process." Opposition politicians have been rounding on the Government in the fallout from Mr Naughten's resignation. Social Democrats TD Catherine Murphy called the NBP "fatally compromised", while Fianna Fáil leader Micheál Martin echoed that sentiment. "The process is absolutely flawed," Ms Murphy told RTÉ's 'The Week in Politics' yesterday. But Mr Naughten's successor, Richard Bruton, said he was committed to implementing the plan to deliver broadband to more than 500,000 homes, businesses and schools. "I'm delighted the Taoiseach has chosen me to lead on this crucial issue and am excited to take on the challenges and opportunities the new role will bring," he said.